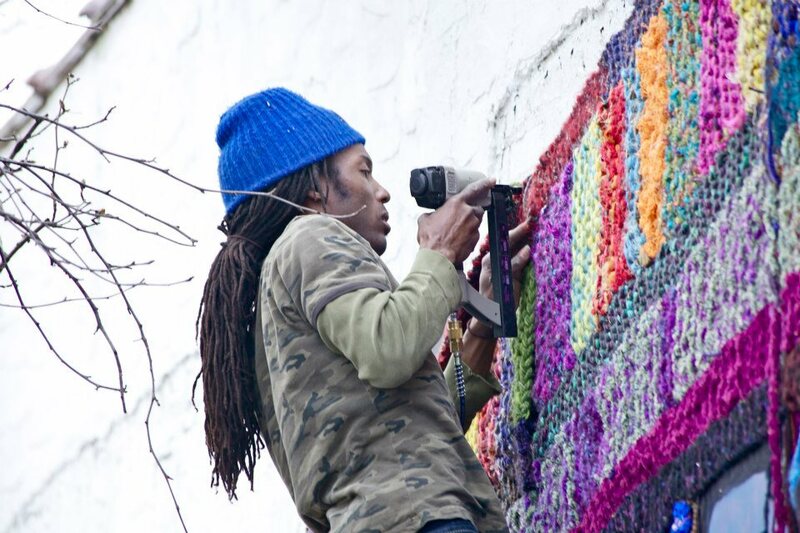 Can yarn bombing build community? Chattanooga-based artist Olga de Klein uses the art of yarn bombing to create connections between people and place. “Trolley” is a 30-foot wide, 15-foot tall mixed-media mural made of yarn and paint on plywood. Sections of yarn knit by residents and supporters of Glass Street visually represent how individuals, when stitched together, can become something greater than before. The mural also celebrates the historic East Chattanooga Belt Line Trolley which connected the Glass Farm District to the businesses and attractions downtown in the early 1900s. The trolley is not only a point of connection for places – it connects people. De Klein’s mural is designed to do the same – inviting people to interact with the installation and ultimately one another. The temporary installation is located at 2442 Glass Street.